This was a really quick and easy Friday night meal. I’ve got recipes for it in at least 10 cookbooks. I don’t normally make it at home because if I ever go out with a group of people where I don’t get a say in where to go, I normally always end up with pasta and tomato sauce. I just fancied eating it though, so I used the version from Vegan Fire and Spice by Robin Robertson. It’s a newish handy book, full of spicy vegan recipes from around the world. I really like the way it’s split into continents and includes starters, main courses and side dishes from across the continent, making it easy to plan a meal. I used a mixture of spaghetti and linguini because I had small amounts of each left. 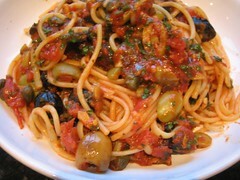 The sauce is simply tomatoes, wine, herbs, olives and capers. We had some garlic bread with it just in case there weren’t enough carbs in the pasta! This entry was posted in Uncategorized, Vegan fire and spice by efcliz. Bookmark the permalink.